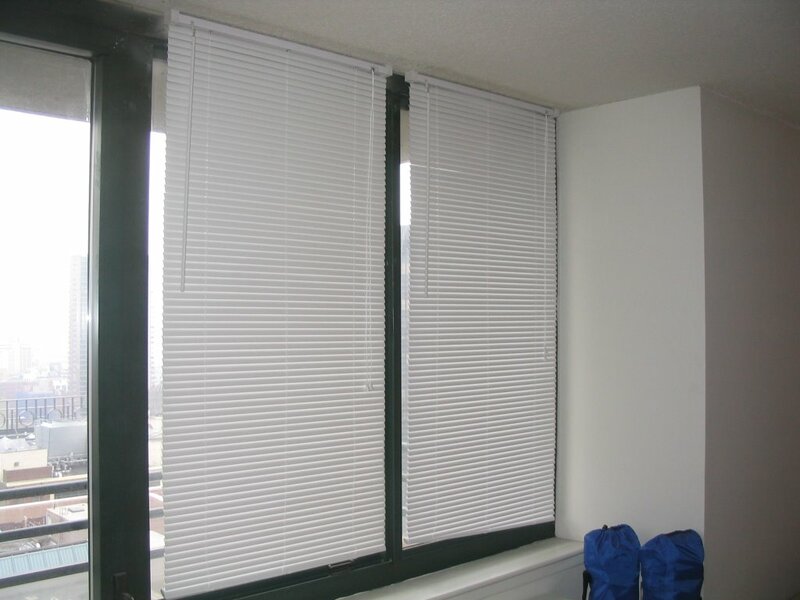 The blinds. They taunted me. They mocked me. I don't think I've mentioned this before, but this was the third trip I've attempted to hang blinds in my girlfriend's appartment. Her ceiling is made of cement, which proved quite difficult to screw or drill into. They resisted every effort I made to put them up from requiring a drill to requiring masonry bits and finally screw mounts. Well, they couldn’t continue to stand up to my efforts, and they are now successfully hanging in her windows! It only took 3 trips to NYC to get all the proper tools in the proper place, but it is done! 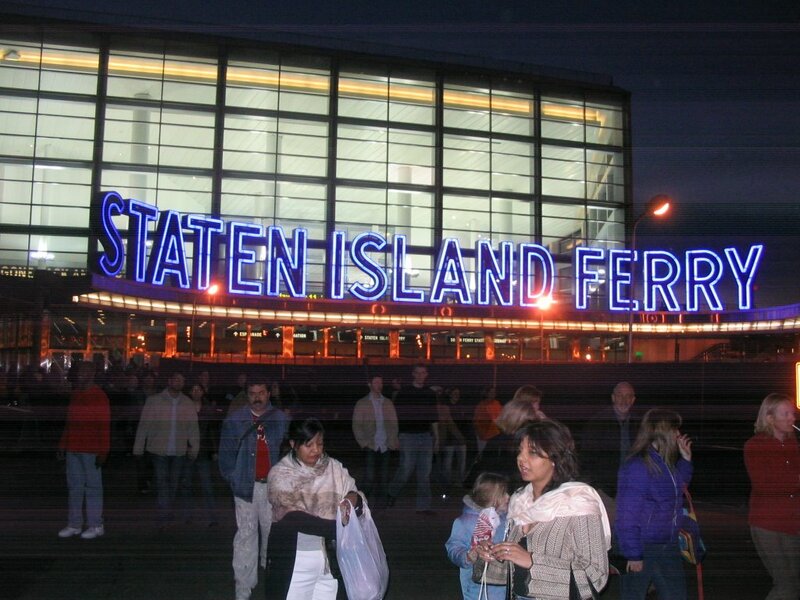 This trip I had the opportunity to ride the famous “Staten Island Ferry” from Manhattan to Staten Island. I was surprised to learn the ferry is free, about the only free thing available in NYC. 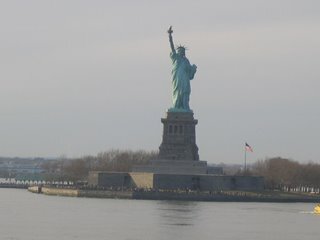 The ferry runs near the Statue of Liberty and provides a great view of the statue from the water. I had been to the Statue about 7 years ago, but it is a completely different feel seeing it as those who came in to Ellis Island would have seen it. I understand how the site of it would be so welcoming after such a long voyage at sea. 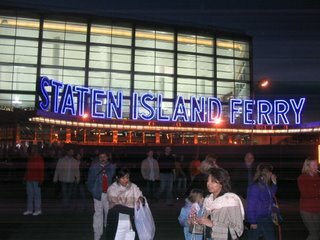 If we would have planned initially on going to Staten Island I would have done a little research to see what there was to do/see while there. From what I could tell, it was nothing but residential and minimal business, almost a suburb. There are plenty of New York trips left, so if we ever get back to the island I hope to be more prepared. David, it sounds like you had an eventful weekend in NYC. Nick and I are planning on spending a day there on our honeymoon - what's the one thing we shouldn't miss? A day? There is a lot to see for just a day. The Brooklyn Bridge is fun because you can walk across, see the city from a distance, see the statue of liberty from a distance, and walk across a cool bridge. If you are there for the evening you can never go wrong with an evening on broadway for a show. There are a number of trendy restraunts in the area there as well if you have some money that you've been meaning to part with. The world trade center site isn't some place you would spend much time at, and you can walk to it from the Staten Island Ferry or Wall Street, but it is worth checking out, just because it is such a major part of modern American history. Central Park is also a must, you can lounge in the great lawn, walk through the castle, and sit by the lake or in the gardens. You might not be able to do all that, all are great, it just depends on what you are interested in doing. Let me just say thank you again for putting up the blinds. They are now blocking out the sun and the neighbors. I know it was quite the effort, but much appreciated. Don't worry, I'm already planning the next home improvement! You are welcome! I'm happy I could help out! Thanks for posting! As for the next project, BRING IT!